Sometimes we all feel like we're four years old again, with that hitching that precedes a flood of tears, hiccuping in our chest. I've had a challenging week on so many levels. What about you? I had days where I just wanted Mum. Alas she is gone 13 years. I know that many fall back on their faith in times of despair. At times I can do this, and sometimes, it seems I am being called to right my own wrongs, and find a way out of the despair alone. That was the case this week. I've really gone back to grass roots and determinedly clawed out some time for me, for reflection, for planning, for goal setting and for a good hard look at where I am in life, and where I want to be. I've realised that nothing we do in life is a waste. If nothing else, when things don't go according to plan, we can dust ourselves off and say 'Well! What did I learn from THAT experience?'. I'm sure some of you think I'm referring to my recent exit from a money saving website some of us know one another from. I can assure you that this was but the tip of iceberg of my challenging week. No matter the why and wherefore, I have been buoyed by so much positive sent my way in a harrowing week, and want to thank you all from the bottom of my heart. Thanks to you all, I feel I am on a good path. A path that will see me fulfilling some dreams and goals, that I realise now, were buried in the humdrum and routine. I've always operated from a stance of gentle encouragement, and that has been my message fairly consistently, both here and on my 'other' blog. I've always felt that the best person to change your life situation is you, and offered my own experiences to illustrate that. So now, I want to return some of the encouragement I received this week. I want to encourage you, to do one thing in the coming seven days, that will make you proud this time next week. It could be a random act of kindness, for example. Last Saturday, my daughter and I bought 3 packets of Ferrero Rocher Chocolates, and approached the cleaner in the food court of our local shopping centre. We said 'Hi. We've noticed how hard you ladies work, and we're pretty sure that nobody ever acknowledges you, so we'd like to give you these chocolates so you know you're appreciated'. Her face was priceless, and she couldn't believe that someone would do that for her, and her colleagues. Heck. They were $3 chocolates. It was the gesture that made an impact. That left us all grinning from ear to ear. Maybe you could rustle up a few bottles of Annabels' bubble bath I mentioned recently. You don't need to spend much on the bottles. Recycled bottles of any kind will do. Sauce bottles, vinegar bottles, even wine bottles if you know someone who drinks wine. Or ask at a local restaurant for their clear empty wine bottles. Wash them well, soak off the labels, and they're perfect. And free. Fancy bottle stoppers are available on eBay for under $3 each, or you can buy craft corks, and seal them with those. Imagine bubble bath in tall bottles, sealed with corks with tea dyed lace, lavish ribbon, or natural raffia tied to their necks, and monogrammes or beautiful decals attached. A gorgeous gift. Maybe you could start a vision journal. How do you want your life to look this time next year? That journey has to begin somewhere. It might mean tidying the garden, it might mean changing jobs, or maybe it means nurturing your relationships. Just start. Having a plan, a list, and an idea of how to work towards that goal, day by day, week by week, is the only way you'll get there. You can't keep doing the same thing and expect a different result, as the saying goes. My primary goal this year, is to have my book at the printer, by Christmas. So I already have my plan on the wall. It's going to be a hard slog to make that happen and I may not get there in time for Christmas. But I'm going to try. Maybe it will be more like Mothers Day next year, and that's not a bad thing. But at least I have a plan. Some mornings, just before I wake, I almost feel my Mothers touch on my shoulder. As if she's there, gently nudging me towards my day. 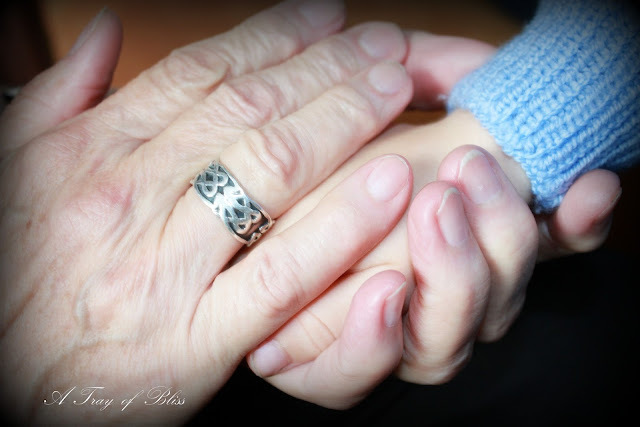 I miss her hand in mine, and her gentle encouragement, terribly. But I have all of you, cheering me from the sidelines, and that is a wonderful bonus in my life. I'm so sorry that you have had such a trying week. It sounds though that you have done some deep soul searching and are once again centered. I pray that you will be able to see your dream come to fruition by Christmas. It is true nothing is wasted. We learn a lot. I will stick to my similar demise from the same place, firstly, and I know now that I learned so much writing there and meeting people (such as yourself!) It wasn't a waste. The enormous amount of work that went into threads and themed months and all of that was appreciated by some lovely ladies but not by the administrators. I was making money for someone else actually but mostly happy to do it. It wasn't a waste. It started something in me that was really good, overall. Certainly other times in life I have put huge effort into making something work, including a marriage, that did not. Still I learned a lot... even if it is being able to feel for someone else in that position. In everything it is amazing how little kindnesses make the hugest difference. Seriously just that someone cares at all is important. I know you spread a lot of joy and kindness and it will always come back to you. Sometimes from the most surprising places! Ill accept the challenge and go above and beyond next week and do something really different that I haven't done before. What a beautiful gesture and random act of kindness Mimi! It's a great feeling to bless someone else. Hugs and encouragement back to you. Your last paragraph re: your mother's touch is so pointedly beautiful. I love when those moments occur. I must be feeling hypersensitive on the subject this week, as it marks 9 years for my mother's passing. We help each other, Mimi. I look forward to news of your book's progress. the grace of God", by Paul David Tripp........it really helps me so much. water ourselves too, I always say. Great, thought provoking blog post Mimi. I lost my mum in 2010 and often cry and wish she was here to give me some firm advice. I too, have had some kicks in the gut over the years, and I reflected and asked what you did and tried to see the lessons in it. However in my case my personal integrity was questioned and it left a hole in my chest, that is permanent. Lovely post MImi and very inspiring re the book. I hope it comes out in time for Christmas, that will be a few presents taken care of :-) No pressure though, LOL. But, oh, sweet, dearest Mimi. It's you who encourages me. It's just that you reap what you sow. What a wonderful thing you did for those cleaners, such a thankless job at the best of times they do...cleaning up the mess of others and some of the mess you see left behind makes you wonder how people really live at home, would they leave such a mess at their own homes? You have always encouraged me with your Random Acts of Kindness, there have been times that I have seen someone have to put a product back as they were 5c short or even 50c short and I have helped out. I once did this for an elderly lady who just cried as she was having a birthday but was short a little for the chocolate that she wanted to treat herself, she was so very grateful. Living in such a small town without support from family, I have been on the receiving end of a lot of help over the last few months having a few bouts of illness and I must say I would not have gotten through without the support of a few friends. I was able to repay the favour the other day to one of the helpers and look after her children after school so she could get a extra things done in town instead of having to return the next day. So in general it does not even have to cost money to do a Random Act. I too will be eagerly waiting your book arrival and hope it all goes well for you. Mimi you really do have a lovely way with words. I think its because you write from the heart. I love reading about what you and your daughter do together, what a lovely thing to let someone in a thankless job know that someone notices. Your crafts that you do together give me such nice memories I things I used to do with my mum. I like your attitude, Mimi. It is always a blessing to bless someone else. It makes everyone involved feel like a million bucks. Thank you for your encouraging post. Such a lovely post Mimi. How kind of you and your daughter to recognise the cleaners in the shopping mall and say 'thank you' with some chocolates. As you rightly say, the chocolates may not have cost a vast amount but it was the gesture that was priceless to those ladies who often go un-noticed. It'd be lovely if more of us the world over took the time just to say 'thank you', no money need be spent. Good luck with your book target, whether you get there by Christmas, next mother's day or even summer it'll be worth it. This was a lovely post. I think we all need extra encouragement from time to time. Sometimes just a smile or little handwritten note can do so much. I often find helping others lifts me out of my sad times. Your RAK was very thoughtful, Mimi. This is such an amazing post! So glad I read it! I'm sorry to learn you had such a difficult week but am pleased to know you are working on a book. No doubt it will be filled with the same sweet spirit of loveliness that I always find here on your blog. May your next week be filled with double joy. Mimi, I'm sorry that you have had a difficult week. I miss my mom every day as well, but often feel that she is watching over me. I truly believe that random acts of kindness make such a difference in peoples life. Something as small as a smile can change someones day. Even a subtle hi, how are you? or a sincere compliment. I try to do this often! Thanks for sharing with SYC. I'm a firm believer that you can learn a lot from hard times, although it doesn't make it any easier, does it? I hope things get better for you and that you can appreciate the good things. That's always the best way to look at tough times. I think you've got the right attitude here! I am sorry that you had a difficult week. I hope this coming week is much easier for you. I am intrigued about this book you are creating and hope to learn more about it.